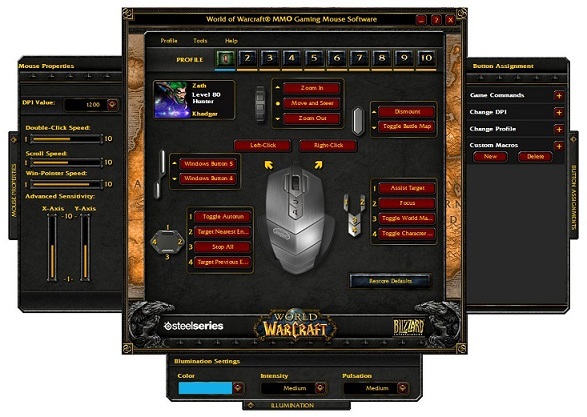 Gaming mice have been around for quite some time but last year saw the launch of the first real mmo mouse – The World of Warcraft endorsed Steelseries mouse. More recently, Razer have also launched a mouse designed for MMO players. I will admit to having tried a lot of mice. I have no idea what I do to them, but I go through mice at an alarming rate. If any companies need their products stress testing, I’m the person. If it’s breakable, I’ll manage it. Prior to my newest mouse, which I’ll come to later, I’ve been using the SteelSeries Ikaris. I’ll hold my hands up and admit that one reason for this was it’s availability in pink. However, after going through three Ikaris in an fourteen month period, all of which developed identical faults, I gave up and decided it was time for a change. For this reason, I haven’t tried the WoW endorsed mouse. I loved the idea of it when it launched but my prior experiences with the Steelseries mice put me off. A little bit of googling about this mouse has also brought up a lot of poor reviews, although most of them seem to be focussed on the first batch of mice which had (I’m shocked), left and right button clicking issues along with random cases of electrocution (no, really). 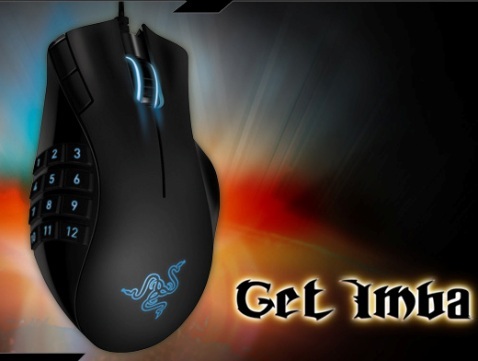 The new Razer Naga gaming mouse is developed specifically for MMO players. I knew the instant I saw this that I had to try it out. I’ve always liked the idea of being able to bind skills to my mouse wheel, particularly those that depend on speed of response. However, it’s pretty easy to exhaust the options of mouse bindings and I won’t touch the whole shift+mouse button click ideas. My next concern was regarding how the configuration or binding of the buttons would actually work. I read mention of being able to download an addon especially for managing these and that did not appeal to me. Not to worry, it works perfectly fine with Bartender with no addition third party programs. 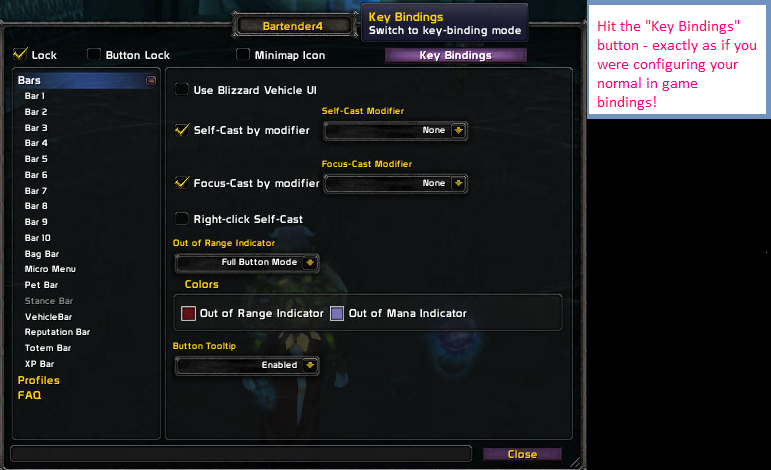 You have two options in regards to the keybindings. You can have the mouse button grid replace your standard 1-0 numbers on the keyboard or, alternatively, you can have it work from the numpad keys. For most players and certainly myself, my prime DPS keys are on keys “`” through to “4”. I didn’t want to play exclusively from my mouse. I have tried this briefly in instances but found chain casting to become quite tiring after the fifth heroic and suspected it wasn’t doing my thumb much good. So, I’ve chosen to let the mice keys replace my numpad keys. These are way too far to the right of my keyboard to ever be used as any useful bindings anyway. Selecting which keys the mouse replaces is done by the flip of a switch under the mouse itself. So yes, this also means you can switch them in an instant should you require. Once you’ve selected which keys the mouse replaces, binding a skill is absolutely straight forward. I can only comment on the configuration using Bartender however, but here’s a few screenshots to show exactly how easy this is. Firstly, open the Bartender configuration addon in game by typing /bartender. This will bring up a window that looks like the following. From here, click on the Key Bindings button found at the top of the window. This will remove the main configuration window and leave you with the key bindings window. As with binding any skill, you scroll over it’s position on a hot bar and hit the key you want to bind the skill too. (Note, hitting escape first will clear any existing bindings attached to that skill). In the case of the Naga mouse, it’s exactly the same, hover over the skill and click on the mouse button you wish to bind it to. It’s that simple. The configuration of the mouse requires no programmes running in windows and no additional addons. Binding anything to the mouse is as easy as to any other key. For me, the beauty of the Naga’s additional binding options comes in being able to add skills that are reaction based to my finger tips. For example, I have Wind Sheer and Purge bound to the first two buttons. My magma and searing totem binds both feature on my mouse, along with my Frost shock (all skills I am most likely to be using on the move). As a shaman, I find particular value in the buttons for totem management. 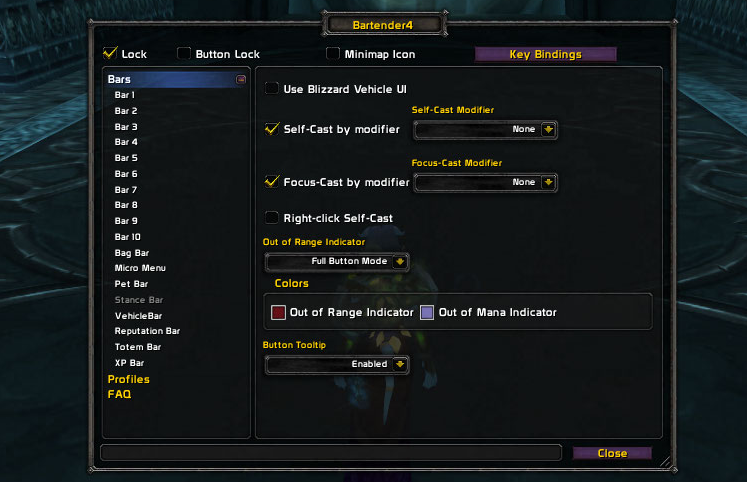 I haven’t used the WoW mouse as I mentioned, but I have dug around a little for reviews and found at least a screenshot of the configuration window for the key bindings. One of the issues I have found is that the key bindings are slightly more fiddly to set up. Below is the shot of the in game configuration for those interested. In conclusion, I tend to be one of those people who likes new gadgets. I can’t help being curious about new mice, new keyboards and the like – pretty much anything that I can see has the potential to improve my style of play. I consider myself quite picky about mice. The size, the shape, the number of buttons and placement of, adjustable sensitivity and durability all matter to me. I can honestly say this has been the best mouse I’ve played with (and as I mentioned earlier, due to the fact I seem to destroy them, I’ve tried a fair few). 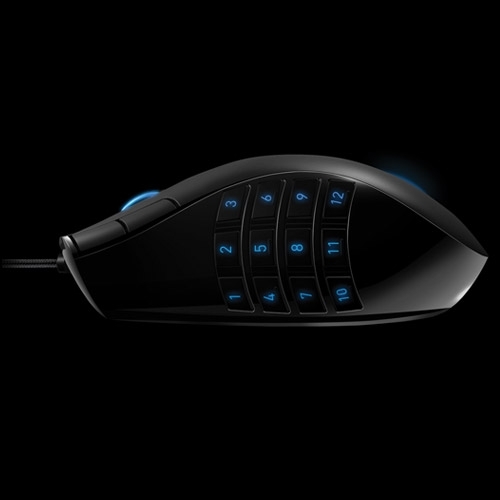 I have one complaint and it’s purely cosmetic (though I’m personally praying to the mouse Gods every night that this will be remedied in a later version), the backlighting behind the button grid, scroll wheel and under the Razer logo can not be switched from blue. Given the recent trend of PC peripherals having customizable back lighting, this slightly disappointed me. So far in the blog, I’ve focussed on how a good user interface within the game can improve your skill as a player. While that section is still a work in progress and I’ll continue to spotlight certain addons that I think are essential for the raiding elemental shaman, there is another related element. I always stress how everything should be key bound and you should play until you know these binds by hear. (Incidentally when using a new UI or key bindings, I thoroughly recommend battle ground play to familiarise yourself with everything). The most common thing I have battled myself in the past and that I hear from guild members is a lack of keys to bind things too. As a female player, I’ve suffered with this a lot in the past. I have relatively small hands so the amount of keys I have available on a standard keyboard (when you consider my comfortable hand span), is quite small. Most players will bind their key skills to the first few number keys. This allows them perfect access to their strafing keys which are generally either Q and E or A and D. Keeping this in mind, it makes sense for as many binds as possible to be in span of this section of the keyboard. You can increase the number of key binds available to you via the use of the shift, alt and control keys. Personally, I am not a huge fan of having hot keys that require two key strokes (for example, shift+1) as pressing two keys simultaneously will naturally make your responses slower. Fortunately, in the last few years the development in computer peripherals has been huge and gaming keyboards and mice are more common place. These frequently bring with them a larger number of keys to aid gamers with the precise problem of running out of convenient binds. What follows is my personal choice in computer peripherals. Obviously, there are far more out there than will be featured here. This article will focus on keyboards. My personal choice in keyboards are Logitech. Since they first released the G11, they have been amazingly popular with gamers due to the additional programmable “G Keys”. These keys are conveniently situated to the left of the normal keyboard and within reach of most players’ little fingers (even with my hand span!) In addition, these are fully programmable to allow you to create you own macros. The most recent addition to the Logitech gaming keyboard family is the G19 and my personal choice. Much like its predecessor, the G19 features two rows of the G Keys. Instantly, this gives you twelve more key bind options. In addition to this, it has three profile keys nestled just above this row of G keys. These profiles can all be configured to hold their own keybinds. So by altering the profile in game, you actually have access to thirty six additional key binds in this small row of keys. When correctly configured, these should ensure that you never run out of convenient keys to use for your in game bindings. As these can be macro’d they’re also the only legal way to automate certain crafting actions in game. Disenchanting and milling are both lengthy and dull processes with no automated feature in game (that is to say, there is no, “disenchant all” or “mill all” option). There are third party programs that will do this by mimicking your keystrokes and repeating them. These are banned by the Blizzard Eula however and their use can result in game bans. In addition to the g keys, the G19 features a colour LCD panel which fully supports World of Warcraft and Ventrillo. What you see here is fully customizable and can be invaluable to gamers. For example, it can be set to display the spell power, haste, crit and hit of your elemental shaman. It will tell you who is speaking on Ventrillo and alert you when someone leaves or joins a channel. If you’re tabbed out, it will alert you to any whispers in game and who they are from. In addition to this it has movie and youtube support. Want to check the positioning on that youtube strategy guide quickly? The LCD will allow you to do exactly that. Have you ever hit your windows key by mistake in game only to have the game minimise at a crucial moment during a raid? The G19 allows you to switch between gaming mode and windows mode at the flick of a key, disabling all windows or context keys while you play (and ensuring you don’t accidentally tab out at a dire moment). The back lighting is now common place amongst gaming keyboards as companies became more aware that many players will be active deep into the night hours and being able to see their keys without additional lighting is really useful. The G19 allows you to customize the colour of that back lighting which is a nice addition for those people who enjoy customizing their PCs appearance. It naturally has USB docks built onto it’s back allowing you to plug your mouse or headset (where applicable) directly into the keyboard. Specially created grooved ridges underneath allow cables to be organised and kept tidy so you don’t have excess wires annoying you while you play. This keyboard has a sloped, removable panel at the front which, as someone who suffers with wrist pains from excessive gaming, I find very useful. It raises the back of my hand enough so that the angle between my wrist and fingers isn’t so harsh to the structure of the wrist. Should you not like this, simply remove it. Finally, it has all the media keys on board meaning you don’t have to fiddle around to adjust your volume. With all these features, the keyboard sounds quite daunting but fear not, the software is excellent and extremely user friendly. Upon the delivery of mine, I did my usual and discarded the manual quite quickly. Never the less, I managed to set mine up with no real problem (including a couple of scripted macro keys) through nothing more than trial and error. If the hefty price tag of the G19 isn’t quite within reach or you have a decent enough keyboard but still lack enough keys, a gameboard might be an option for you. These have another advantage in that they most commonly feature a thumb stick allowing character control exclusive of the mouse. For PvP play these can be godly but they can take some getting used to initially. 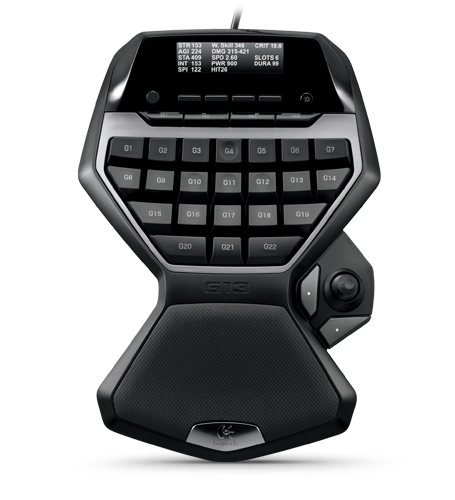 The only gameboard I have personal experience with is the Logitech G13, though again, there are a number of similar products on the market. One awesome feature I loved about this product was the contoured wrist support. If, like many gamers, you suffer with wrist problems this is a definite product for you to consider. Much like the other Logitech keyboards, it features their popular G Keys. The G13 offers 25 of these all with the same customizable back lighting of the G19. The thumb stick allows for character control but in my experience, took some adjusting too. Again, this product has an LCD screen that displays relevant information to what you’re playing. It also offers the same Ventrillo support so you can see who is speaking or when people join the channel or server. A huge advantage of this is the portability. If you’re short on desk room, you can store this away when you’re not playing. If you frequent friends houses and wish to play, you can take it with you. Despite this portability, it’s very stable. It doesn’t move around on the desk at all (which is certainly something I was initially concerned about). In closing, if a lack of keys is a problem for you, I’d strongly encourage you to consider a gaming specific keyboard or the slightly cheaper option of a game board. Being able to bind (and ultimately learn) all your hot keys will vastly improve your play as you’re better equipped to respond to any give situation hastily. The second part of these articles will focus on gaming mice.